Our ski hosting service is a free service is for skiers that can comfortably ski blue and red runs with confidence. 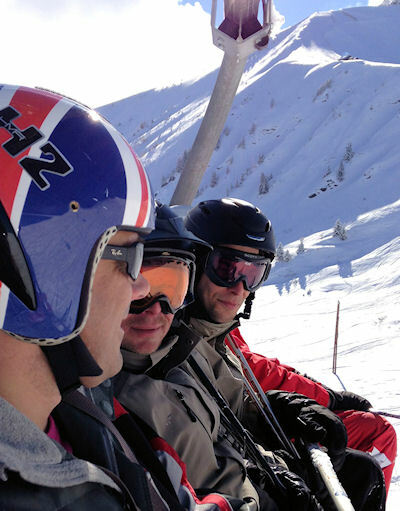 Our ski hosts attend a pre-season ski hosting and mountain safety course so you can be sure you are in safe hands. Groups are small, fun and informal. Our hosts are available to ski with you on Monday, Tuesday, Thursday and Friday mornings, we aim to cover the Rochebrune, Jaillet and Mont D’Arbois ski areas. We’ll take you to the quietest slopes, find the best snow and of course show you our favourite coffee stops and mountain restaurants. Our ski hosts are good skiers who know the Megeve ski area well, however they are not ski instructors and cannot provide any Instruction to guests. Due to recent changes in French law it may be necessary to suspend our ski hosting programme. If you are just starting out or would like to book a ski lesson, Megeve has a choice of excellent ski schools to choose from.